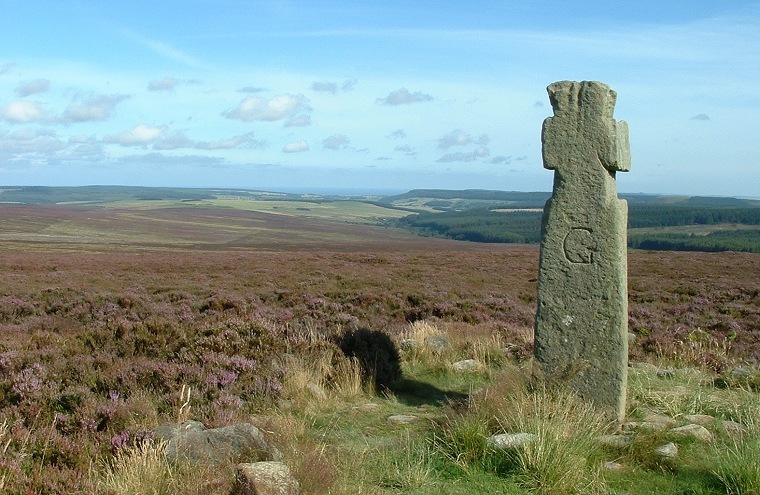 The site of Lilla Cross once formed the boundaries of four Medieval parishes as well as the junction of two trackways and the limits of an estate belonging to Whitby Abbey in the 11th century - it still forms part of a modern political boundary today. Long before this of course the Bronze Age inhabitants of the North Yorkshire Moors area built a round barrow here that formed part of their own territorial boundary that included Flat Howes, Pen Howes, Breckon Howe, Sil Howe, Flass Brow, Robbed Howe, Foster Howes, Ann Howe, Louven Howe, Lilla Howe, High Woof Howe and Low Woof Howe. These barrow run in a roughly northwest-southeast direction from Black Brow close to the High Bride Stones down to near the head of the valley of Stockland Beck about seven miles away in what is now the Langdale Forest. The barrow of Lilla Howe itself was constructed of earth and stone and measures about 20 metres in diameter and stands over a metre tall although it has been quite badly damaged over the years - the photograph above shows a track cutting across the southern edge, there is also one to the north. The site has fine views with Goathland Moor to the west, Sneaton High Moor to the north, Fylingdales Moor to the east and Langdale Forest to the south. The cross takes its name from an 8th century Saxon nobleman who died saving the king's life although the style of the carving is thought to date it to the 10th century, it is interesting to note that excavations of the barrow have uncovered Anglo Saxon and Viking grave goods. Just a few paces to the northeast of Lilla Howe at SE88929871 is another smaller barrow that is easily overlooked, it measures around 13 metres in diameter but is only about half a metre high and badly overgrown.